"I didn't realise how much stock we were losing through theft until after the system was put in. When I look at the weekly cost of the cameras against the cost of that stock, the cameras are making me money and worth every penny." Global Tec Security design, install and maintain intruder alarm systems to SSIAB standards and are compliant with all insurance company requirements. Our systems comply with the Association of Chief Police Officers intruder alarm policies (ACPO)together with Intruder Alarms PD6662:2004 incorporating DD243:2004 and EN-50131-1. Our highly skilled engineers will install your security system with the minimum of disruption and to exacting standards. All our engineers are full time employees and security vetted to the stringent British Standard BS7858:2004, we do not use sub contract labour. With our free no obligation survey we can find the right solution for all your security needs. Please click on the link to arrange an appointment. 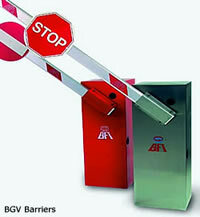 We also supply and install security gates for home and commercial businesses. Combined with a wireless control system and cctv sophisticated multiple entry systems can be controlled easily and effectively from a single point. Global Tec Security specialise in the latest access control systems including Fingerprint readers and Retina scanners, our access systems can be controlled via TCP/IP (computer network) for greater security and ease of controlling site security. Please view a sample of the products we offer on this page or contact us for further expert information and advice. 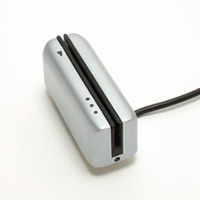 All our engineers are attentive to the latest products and trained to the highest possible standards. 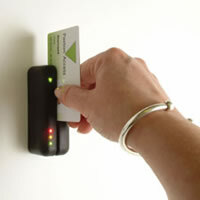 Access control is not just a means of restricting access to property, systems can be used to allocate car park spaces, lift control or checking identity with a PDA hand held computer. Global Tec Security install a wide range of CCTV equipment from small domestic to large commercial installations. We have access to all the major CCTV manufacturers' products and can offer the most comprehensive services the industry can provide. Global Tec Security design and install to the following standards: CCTV - NACP 20. With our free no obligation survey we can find the right solution for all your security needs. Please click on the link to arrange a Global Tec Security survey. What is the purpose of each camera? Is night vision required (infra-red)? What areas require coverage? What type of recording is required? Has the data protection act been considered? Global Tec Security specialise in surveying and designing high quality CCTV security systems and can provide a comprehensive system design free of charge. Global Tec Security is a full company member of The Master Locksmiths Association. Our trained locksmiths are highly skilled to cover all aspects of the business including vehicle and safe opening. © 2010 Global Tec Security Ltd.